It was a big week for podcasts, and for Credit Dot Pinball. Both Coast 2 Coast Pinball (Episode 87) and the Pinball Podcast (Episode 33) released new installments, and both shows were nice enough to mention this site. If you have not taken time to follow Nate Shivers’ podcast, Coast 2 Coast Pinball, now is the time. Mr. Shivers is scheduled to attend the Northwest Pinball and Arcade Show in Tacoma, Washington this weekend, and will also attend the Southern Fried Gameroom Expo in Atlanta, Georiga at the end of June. If his field reporting from the Midwest Gaming Classic is any indication, Coast 2 Coast Pinball will be the place to get detailed information, comprehensive insight and exclusive interviews from these shows. Being total gaming events, the shows will have a great deal of video arcade content, and Nate’s coverage promises to be exclusively focussed on the pinball material. I was honoured that he took the time to mention Credit Dot on his show, even though he admits long form writing isn’t his bag. The best way you can show your support for Nate and Coast 2 Coast, besides listening, is by buying a Coast 2 Coast Pinball T-shirt, for only $15USD shipped within the US (see the link on the C2C main page). The Pinball Podcast followed through with the promise of more shows with their second episode of the month. The appeal of this podcast comes from its unpolished style and wayward meandering through a loose structure of topics. Less structure certainly does not mean less professional or less entertaining. The Pinball Podcast is a favourite of mine because it feels like you are listening in on a conversation that Don and Jeff are having over a few beers on league night. Sure, there is lots of pinball talk, but they weave off course and talk about films, parenthood, travelling and Jeff’s favorite topic, medical ailments, before righting the ship back to a discussion about pinball. Given their rapport, it is incredible to find out that hosts Don and Jeff are more acquaintances rather than best friends. They live in different states and were originally united only through a shared love of pinball (So the story goes, at a Pinball show a few years ago, one host-to-be asked “Hey, wanna do a pinball podcast?”, “Um, sure,” the other replied). I am indebted to Don in particular, as I corresponded with him at length before starting Credit Dot, and to be very honest, it was his advice and guidance (along with my wife’s, too) that spurred me to follow through with the idea of writing about pinball. I have a very long e-mail from Don that I go back and look at every time I feel too discouraged, or too lazy, to sit down and write. So if you hate the essays that appear here, blame Don. I am grateful to the Pinball Podcast for mentioning Credit Dot on their show as well, and I strive to be to the pinball blogging universe what they are to the pinball podcast universe. I hope to bother Don and/or Jeff in the coming months to appear as guest columnists and provide some exclusive content for Credit Dot. 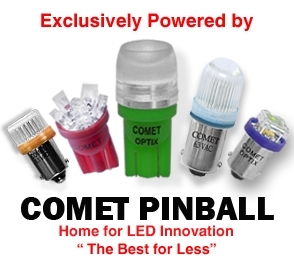 Categories: Podcasts | Tags: Coast 2 Coast Pinball, Nate Shivers, Podcasting, The Pinball Podcast | Permalink. Coast2Coast host Nate Shivers moderated a talk with a bevy of pinball luminaries last weekend at the Midwest Gaming Classic in Brookfield, Wisconsin. Shivers recorded the event, and it has been released as Coast2Coast Pinball Episode #77. Nothing ground-breaking is discussed here–Steve Ritchie is the king of innovation, John Popaduik places theme/art above all else, Ben Heck likes to hear himself talk–but its cool to hear the interactions (or divisions?) between the old guard (Trudeau, Ritchie, Freres) and the new boutique designers (Emery, Heck, Kulek). The talk DOESN’T devolve into a reminiscence about the good ol’ days at Williams, which is refreshing and disappointing all at the same time. Stern employee Trudeau, when asked about innovation, said that it all starts on the playfield, in other words dismissing JJP’s innovative backbox LCD screen (or just providing a reason why Uncle Gary hasn’t adopted the technology yet?). Stern employee Ritchie wouldn’t acknowledge the Wizard of Oz by name, instead making reference to it as “the girl with the red shoes”, and claiming (perhaps rightly) that you can’t milk any excitement from the theme. Tanio Klyce is probably a name unfamiliar to most among the other giants on the panel…but you’ll be familiar with him after the podcast as the guy who rambles on and on and on and basically has very little to say. But can you blame him? He’s on a panel with some legends and is probably a bit out of his class. If nothing else, its great to hear Popaduik pontificate about pinball. He exudes brilliance. His is a voice noticeably absent from Clay Harrell’s old TopCast interviews, and I’m not sure I’ve heard him speak about pinball in its other forms in the past few years. From what I gather, he saves his communication energies for those that have committed to put down $16,000USD for a pinball game that has not yet been built. Nate doesn’t have to do much moderation–the 50-minute set unfolds through the kinetics of the speakers–but its great that he was able to record the event for his podcast. Give it a listen. Categories: Podcasts | Tags: Coast2Coast, John Popaduik, John Trudeau, Midwest Gaming Classic, Steve Ritchie, Tanio Klyce | Permalink.